If you have already purchased a license and you want to enable it for use on multiple computers, you can upgrade your license here. NOTE, you must have already purchased a license for this to work. You cannot buy a license from this web page. Once you have completed the upgrade, you can apply your license file to one other computer for the 1PC to 2PC upgrade, or to multiple computers in your household for the 1 PC to household option. MCE LoveFilm is available as either a free version which has access to basic LoveFilm controls, or a premium version which has access to all features. When you attempt to use a premium feature in the application, you will be prompted to upgrade within the application. You can purchase the upgrade quickly and easily through paypal, either by credit card or with a paypal account. 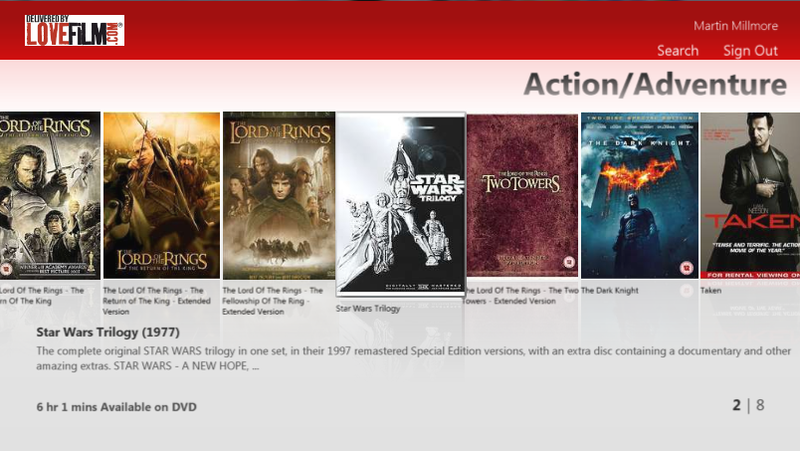 Once you have completed the purchase, simply return to MCE LoveFilm and click the button to complete the upgrade. Your license key will automatically be installed. If you have already purchased a license and you want to enable it for use on multiple computers, send an e-mail to sales@milliesoft.co.uk for instructions. Unfortunately Amazon have changed the way videos are played, and we can no longer work with it. MCELoveFilm no longer works. Thanks for your support over the years though. Martin. LoveFilm for Media Center allows you to watch streaming movies from Amazon Prime Instant Video, list, all from your Media Center PC. It is compatible with amazon.com, amazon.co.uk and amazon.de*. Windows 8 – MCE LoveFilm is compatible with both Windows 7 and Windows 8. If you are upgrading to Windows 8, you can use your original MCELoveFilm license which was e-mailed to you when you purchased your license. Don’t forget to upgrade Silverlight in Internet Explorer before playing videos. Thanks to Matt Matthias who came up with the excellent screen designs.